This blog post is in honor of Self-Injury Awareness Day (March 1) and contains references to self-harm. It has been a little under 11 years since I last self-injured. It identifies a starting line (that was in its earliest moment an arbitrary point). It reminds us that today exists. I could just as easily tell you that it’s been: 1,182 days since I adopted my dog, or 57 months since my wedding, or four hours since my last dream… But none of these numbers actually tell a story. They only inform you about distance, and I’ve learned to become much more passionate about proximity. Looking at a calendar or a watch can’t tell you about the lessons learned, about the victories achieved when the road was most challenging. Time doesn’t tell you about the late-night phone calls answered, the grocery store runs when the razors were returned to the shelf, or the first time I decided to walk out the door wearing shorts. Highlighting time doesn’t do justice to the idea of progress. Far more memorable—far more significant—are the moments when I embraced the belief that I was worthy of embrace. These were and are the conversations that require nuance, details, and perspective; they are curious and patient and co-creative. When I look back on my history and struggles with self-injury, what is most prominent is a sense of exile. I can still remember the palpable distance I felt, the echo in my voice that reinforced the certainty that I was alone. I got lost in a cycle of fog, where I couldn’t discern if my self-injury fed my sense of aloneness, or if my aloneness fueled my self-injury… at any rate, I believed that this distance from others was something I deserved. It’s clear now that my shame was nourished by a lack of perspective. What I needed was an outside voice reminding me that my chest could and should carry more than emptiness. Her response became a lifeline: “No. We can get through this together.” Those words crossed her teeth with confidence as if my pain was wholesale unable to scare her. She showed that she was committed to loving me despite all the reasons I gave her not to. Her heart possessed a wisdom worth emulating, that she didn’t need answers before she articulated her belief in me. I wasn’t “fixed” in an instant and I would still encounter plagued narratives and behavioral slips, but that conversation represented a discernible turn. That night, she reminded me that there is nothing in this life that I need to do alone—coffee, dinner, exercise, rest, cry, dance, laugh, sing. All of these things warrant collaborators. All of these things deserve an audience. To be clear, I am not claiming that inviting other people into your story will immunize you from pain, but I have learned that by including friends, family, mentors, and counselors into your life, a better scenario will become more obvious. For all of the moments where you can’t see a way out, know this: you will outgrow your uncertainties—and you don’t have to do it on your own. This is not about getting better, not about sustaining remission, not about avoiding relapse—because those are consequences, not targets. It’s not about having your life “put together” before it can be shared. Nor is it about distilling your story into a brief synopsis, because you should be unabridged, covered in footnotes and cross-referenced by your greatest fans. You do not need to be complete or polished in order to be known. It’s about learning new truths and releasing old thoughts. Perhaps I am not alone in believing that my self-injury was a compelling reason to keep others at bay, to keep myself alone, to keep separate. At the time, that distance felt necessary and real, but it was only imagined. 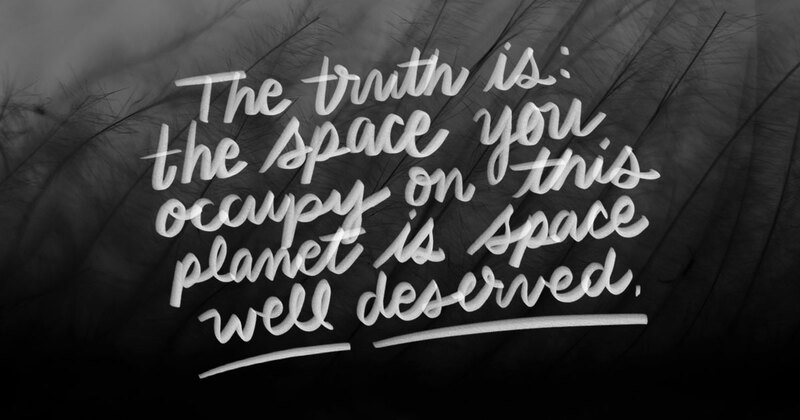 The truth is: the space you occupy on this planet is space well deserved. The truth is that we can still find opportunities to grow and heal and process hurt in the presence of others. It’s the kind of growth that decreases the space between us. A growth that is not measured by the distance between us and relapse, but rather in the vanishing of barriers. It’s a growth that will eventually bring us to the point where we can’t help but collide. And when my friend replied with “we can get through this together,” she was asserting that our time and space would be shared. That I wasn’t moving forward alone. And so, we want to extend that invitation and lean heavily on this mantra—that regardless of how far you’ve come or how long you’ve been traveling—you can join us in saying: I am here. Now. In good company. If you or someone you know is struggling, please visit our FIND HELP page to connect to the help you need and deserve. You are worthy. You are not alone. We turned this mantra by Chad into a new design for you to wear. Our hope is that you will carry it with you as a reminder that your journey of recovery is not one you have to travel through alone. You are in good company. 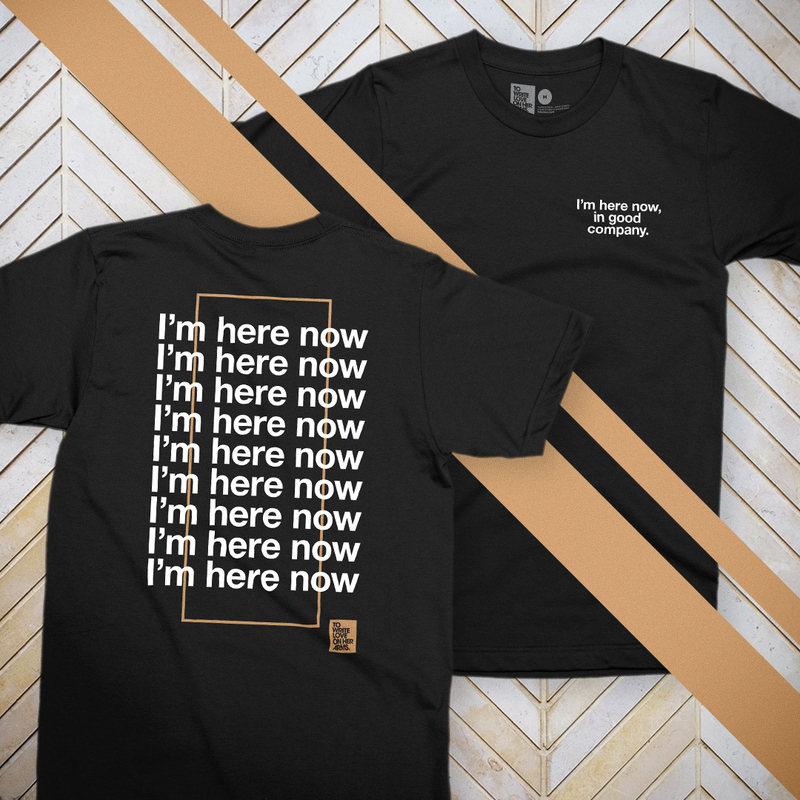 You can order our “Here Now” shirt in the Online Store. I really love this. Thank you. Thank you for this. I miss you all. I’m almost 3 months and that is the inspiration I need. In hopes, I at least can retain it. Thank you Chad, and thanks to whoever reads this reply. I can say I have 8 months clean in 4 days!!!! …And i too believe, today, that I belong here. After all the hurt and pain, recovery and growth wins! !